Although concrete is pretty maintenance free, you should take some steps this spring to make sure your driveway stays as undiminished and welcoming as possible. After all, your driveway is the welcome mat of your home. Here are a few things to check now that the snow has cleared. During the winter, many of us think that using de-icing agents to get rid of pesky ice and snow is the best option, but many de-icing fluids can do more harm than good. If you used any of these liquids, clean your driveway thoroughly to remove the chemicals as they can cause additional wear to your concrete surfaces if allowed to soak in. Spring also will often reveal any stains that may have occurred during the winter. Fortunately, there is no big secret to cleaning strange stains off your concrete. If you spot a spill mark, try to determine the source of the stain and use whatever cleaning agent you would typically use to remove that specific stain on any other surface. So, if you find an oil stain, for example, use a cleaner meant for oil stains to help remove the blemish from your concrete. Don’t forget to keep an eye out for potential scratching to your surfaces from lawn furniture or the dragging of work equipment this spring. When bringing out your lawn mower, wheelbarrow for planting or anything else, it can be easy to just want to drag it across the driveway. However, these small scratches can be the starting points of cracks and crevices that can ultimately lead to the failure of your concrete. Know that damage can occur and avoid scratching concrete surfaces in the first place. If you face stains, scratches or imperfections that are simply out of your wheelhouse, call to get an inspection from a concrete expert at Templin Concrete Construction who can provide greater advice or offer solutions to fix or remove imperfections while restoring your concrete to its original glory. Once the warmer months come along and you are ready to show off the accents of your home, consider getting some decorative concrete work done. Perfect for driveways, patios and more, decorative concrete work can be completed in a variety of styles, patterns and colors. You can even add a special sealer to your concrete that will give it a classy “wet” look. Concrete work is so much more than the dull, gray, flat concrete slab. Today is the day of the classy and decorative concrete layout, which can add new and appealing looks to your home. Take time to care for your concrete surfaces and keep your home looking like new! 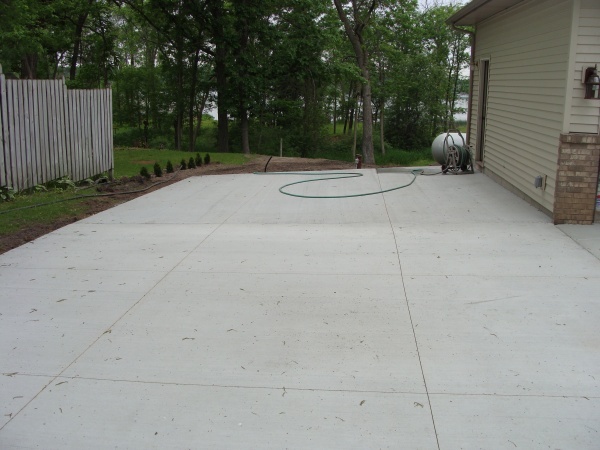 To learn more about new concrete installations or to request help from one of the experts at Templin Concrete Construction, call us today at 612-388-1945.